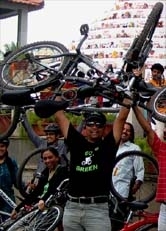 GoGreen Special support ride 10Jul11 - GGI-Group size: 4000+ Professionals, Increasing on day to day basis, Come & join us 2 serve Mother Nature. 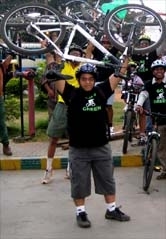 10 July 2011, Just after inaugurating Oberoi Hotel's bicycle parking, Today one more bicycling parking was inaugurated @ Lalbagh's South gate on 10 July, Go Green Group were supporting by participating in huge numbers. 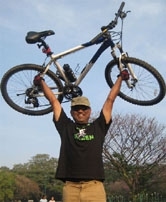 Honorable Urban Minister Mr. Suresh Kumar was the chief guest who inaugurated the bicycle parking stand. Our Bhaskar Rao was also present. This is one of its kind of Parking which would be made available @ most of the common places. ..